This is privacy notice of Fenland Garage Doors Ltd.
Mrs W Parish is the controller and responsible for your personal data (collectively referred to as Fenland Garage Doors Ltd , “we”, “us” or “our” in this privacy notice). Our contact details are Fenland Garage Doors Ltd Unit 2-3 Bexwell Business Estate Downham Market Norfolk PE38 9LT Tel 01366 382815 or wendy@fenlandgaragedoors.co.uk . For all data matters contact Mrs W Parish. Mr R Legge is the controller and responsible for this website. Contact Data includes Billing address, Installation address Email address and telephone numbers. Legitimate Interestthis means the interest of our business in conducting and managing our business to enable us to give you the best service/product and the most secure experience. We make sure we consider and balance any potential impact on you (both positive and negative) and your rights before we process your personal data for our legitimate interests. We do not use your personal data for activities where our interests are overridden by the impact on you (unless we have your consent or are otherwise required or permitted to by law). You can obtain further information about how we assess our legitimate interests against any potential impact on you in respect of specific activities by request. Note that we may process your personal data for more than one lawful ground depending on the specific purpose for which we are using your data. Please contact Mrs W Parish if you need details about the specific legal ground we are relying on to process your personal data where more than one ground has been set out in the table below. 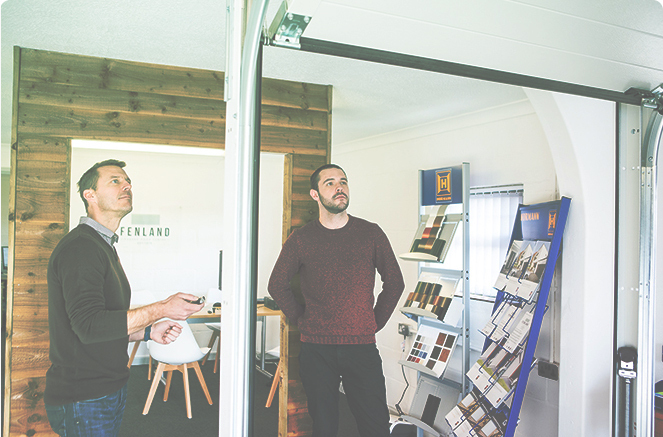 We will get your express opt-in consent before we share your personal data with any company outside of Fenland Garage Doors Ltd group of companies for marketing purposes. You can ask us or third parties to stop sending you marketing messages at any time by following the opt out link within the marketing email or by emailing our info@fenlandgaragedoors.co.uk address. Where you opt out of receiving these marketing messages, this will not apply to personal data provided to us as a result of warranty registration, product or service experience. We take the privacy of our website visitors and service users very seriously and are committed to the protection and security of personal data from our website visitors and customers. timing, frequency and pattern of your website use. The lawful basis for this processing is our legitimate interests in monitoring and improving our website and services. We do not use your personal data for any marketing purposes including direct marketing. HM Revenue & Customs, regulators and other authorities within the United Kingdom for reporting and processing in certain circumstances. We have put in place appropriate security measures to prevent your personal data from being accidentally lost, used or accessed in an unauthorised way, altered or disclosed. In addition, we limit access to your personal data to those employees; agents, contractors and other third parties who have a business need to know. They will only process your personal data on our instructions and they are subject to a duty of confidentiality. By law we have to keep basic information about our customers including contact, identity and transaction data for 6 years for tax purposes.